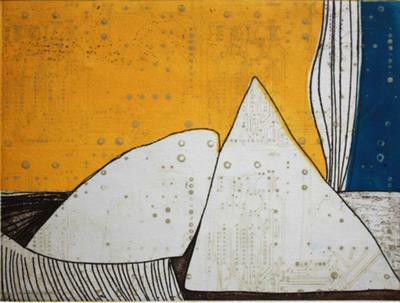 Thinking of Place is a collaborative venture between Inkmasters Cairns Inc, Goldfields Printmakers (Victoria), Melbourne Printmakers Group, North Island Printmakers (New Zealand) and Te Wai Pounamu Printmakers (New Zealand. Artists have engaged with the theme for Thinking of Place with works related to concepts of land, country, the built and natural environment, colonisation, ancestral connections, identity and imagined locations. The collaborative series of exhibitions has been organised by Inkmasters Cairns Inc., a not-for-profit group aimed at raising the profile of printmaking as an art form in Cairns, enhancing regional skills through a series of ongoing workshops and providing opportunities for artists by promoting their work to a wide audience. Established in 2011, Inkmasters has a broad-based membership, supporting emerging artists, recent graduates, experienced professional artists both indigenous and non-indigenous. It promotes the work of members through regular exhibitions, regional, national and international print exchanges and collaborative projects including the 2013 Inside Out: Mapping Spiritual Journeys breast-plate exhibition. Full membership fee is $30 annually. Associate membership (Web only membership) is free.